Roll out the barrel, and put on the polka records, it’s time for some pickled roast meat! Sauerbraten is a very common – some say the most well known – German dish, literally meaning pickled roasted meat. Although it varies from region to region, in essence, it’s pot roast that has been marinaded in a vinegary marinade prior to cooking. While beef roast is the most common and accepted cut of meat, others can be used, and some say it is traditionally a cut of horse that was originally used. (That’s way back in history, Caesar or Charlemange’s time, don’t worry!) The marinade helps to tenderize the meat, as it is usually a tougher cut of meat used. Some come out with thick gravy, and it is almost always served with potato dumplings and red cabbage. Since I can’t stand even the thought of red cabbage, I’d probably substitute sauerkraut which is somehow more appealing. I know, I’m weird. You can also serve potato pancakes, but apparently these are popular in only a very small part of Germany. Serve with strong warm beer for the full German effect. Boil potatoes – chill well – peel – rinse. Add eggs, salt & flour. Saute bread cubes in butter. Enclose with potato mixture, making 1″ balls. Roll in flour. Drop into boiling salted water a few at a time. Cook 4 min. After they rise to surface, drain & put into serving dish. This one doesn’t sound so bad…just time consuming! In reading the recipe card, I don’t actually think there is a missing word. I think you are supposed to keep it hot and a bit as needed to the meat to keep it moist. Apparently adding cold marinade would be bad. The confusing part is the kettle reference twice. Since you add all the marinade back in at the end, it makes since to add it in bits while cooking. I just really want know what would happen if I didn’t keep it hot. I suspect that if you were to add cool or cold marinade to the cooking roast it would dip the temp of the meat. By keeping the marinade hot you will keep the meat at a consistent temperature. I agree, there is no word missing. The roast would have a tendency to dry out after a length of time, and more liquid should be added. Keeping the marinade hot (I assume) would mean the when adding the temperature of the meat would not cool off. I think this too could be done in a crock pot, and I’d probably add most of the marinade and adjust the liquid level at the end. Also there are too many ingredients and I would never make it. Five or six ingredients is now my limit. This is quite late for a comment – but this seems to be quite similar to a recipe I’ve been looking for from the 1970s found in the NYT International Cookbook. 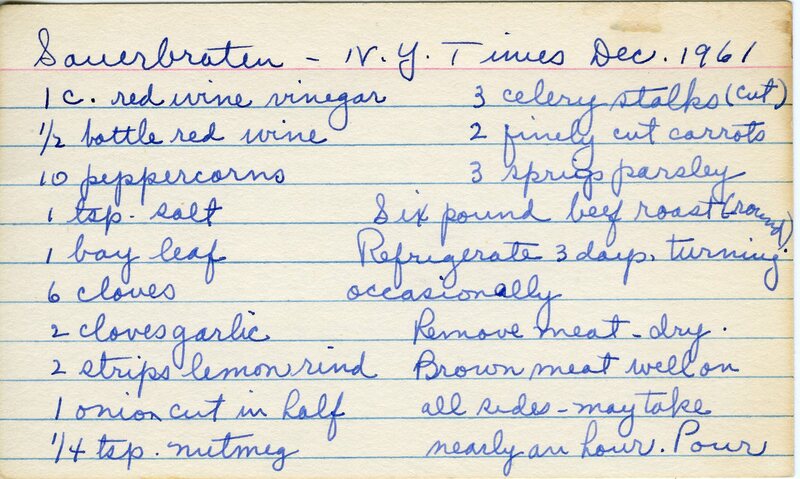 I remember red wine vinegar, red wine and beef stock and no gingersnaps – the sauce was thickened with cornstarch. I also agree there is no missing word – although I remember getting tired of adding the marinade little by little and adding it all at once, along with the beef stock. I also remember straining the stock before making the sauce. I don’t recall it taking an hour to brown the meat. 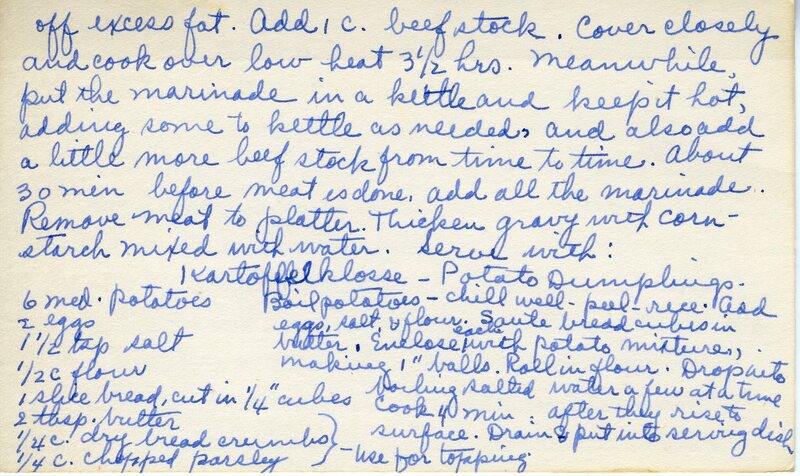 Thanks so much for posting this recipe – my parents, now in their late 80s, asked me yesterday to make this for them. It’s a great recipe!! I’m so glad to have helped out with this old recipe for you! ok, when my mom made this, we loved it. she would slice the onions and use half & half vinegar and water with spices for the marinade. and you do have to turn the meat over twice a day. she always bought a “rump roast” and after browning we would add the liquid but not the solids from the marinade. if adding wine you could use the opportunity to deglaze before that step. we would use the pressure cooker to make chunky applesauce with stick cinnamon cooked in it. cook till “pulled pork” kind of tender! then we would add a whole mess of sliced onions and carrots and little red potatoes and cook till they were fork tender. The little potatoes were really for dad ’cause all us kids wanted mashed. brussel sprouts was what she liked to serve with this and she thickened the stock with cornstarch and water. I know we always re-seasoned with fresh spices before actually cooking the pot roast and that may help you the next time you may try this. That sounds really delicious! Thank you for your contribution!